What began as a hobby eventually became a vocation. As a child I would build go-carts and various other toys. In college I sharpened my skills to work for Larson’s Builders for a few summers to help with college expenses. 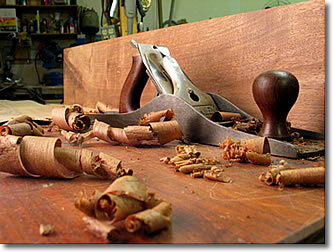 Wood working and remodeling was a side job that began in 1991 for many years. The requests began to grow and grow and since I enjoyed what I did, I decided in 1999 to start this as a full-time remodeling company specializing in kitchens, bathrooms and custom furniture. I feel amazingly blessed that I can go to work doing what I love to do. I love helping people, designing and making custom pieces of furniture, restoring and making old damaged pieces like new again and remodeling kitchens and bathrooms. Most of my clients come from referrals. I find myself staying constantly busy with new jobs all the time.